The idea of Silver Stream Gospel Music Festival started in 1999 when I was doing sound for a outdoor concert in Blumenort Park. A few of us Christian brothers got together and talked about putting on a outdoor music festival, this was in the middle of June. And two month later we had our first Music Festival. It was planned for on the September long weekend. I went and booked a tent and my wife planned for some food. We planned for 300-500 people and 700 plus people showed up. 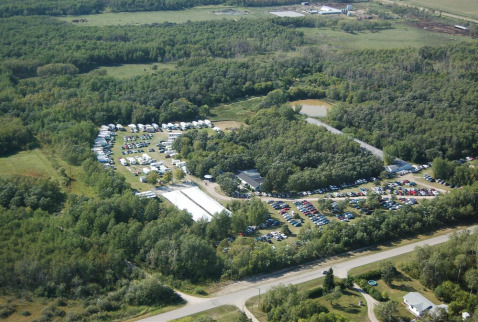 Now we have reached as many as 2500-3000 people, and have had as many as 84 campers on our yard. We thank God every year for what He has blessed us with. We never thought that this is what would happen. Our desire is that He will be glorified and praised and that we will be closer drawn to Him and that hearts and lives would be changed and bring newness of life in our souls. A little bit about myself. I have loved music since my teenage years. I have played musical instruments also since my teens. My sister and sister in-law joined up with me and we sang as The Dueck Family. Later a few more members joined in, and we started a group called Springs of Living Water, we sang together for about 17 years. In 1985 I started my recording studio; Silver Stream Recording, and this gave inspriation for the music festival. I have played bass guitar and 6 string guitar for a number of different groups throughout the years. For the last 6 years I’ve played bass for a group called Instruments of Grace. I have had a number of opportunities to go out and sing. And my sister still joins me from time to time. I have run sound equipment for about 45 years in church. For the last 18 years helped with the sound in Portage Christ Church music night every 1st and 3rd Saturday of the month from September to May. For the past 11 years we have put on a music night once a month in our local church, 2nd Saturday of the month from November to April. I have done sound for many weddings, anniversary’s, concerts and many other functions. Now you can see that music is my life. I thank God for it many times. As far as my wife is concerned, she does not sing or play any instrument, but she does support me in my music. She does have a gift. She is good with food. For the last 17 years she has done all the food planning for our festival, in later years her sister has helped her with some of the planning. There’s got to be food when there is music. We have no planning committee just Martha and myself, but without the support of our family and many volunteers, this glorious occasion wouldn't be possible.